Let’s Get Physical to Connect to the Mind! Many yoga studios and teachers in the Western world are often criticised for practising only the physical aspect of yoga, offering instruction on postures and breathing alone! It’s almost as if doing yoga for physical benefits alone is not following the true path! Is this wrong to concentrate on the physical and is it the same for teenagers and children? ‘Mindfulness’ has become the key word in Primary & Secondary education, which is absolutely wonderful. Yoga is, of course, the ultimate mindfulness tool! Mindfulness is about staying in the present moment, accepting and appreciating everything as it is. It’s a perfect practice to deal with the everyday stresses of school life. Some teenagers and children, however, do find it more difficult to concentrate, focus their minds and feel the positive effect. Alignment based Yoga, which takes physical awareness to a deeper level, is often referred to as ‘meditation in motion’. This can help achieve mindfulness for those who struggle to sit still. Here attention is directed to particular parts of the body while the child is in a yoga pose. The awareness is on how the body feels, all the sensations, keeping the child very focused on the present moment. This focus takes the child’s attention inwards and contributes to the withdrawing of all other senses and distractions. Yoga is, also, often advertised as a non-competitive activity, encouraging those who don’t like sports to exercise and help deal with childhood obesity. The government website www.gov.uk quotes 2018 childhood obesity statistics as more than 1 in 5, on beginning primary education, to almost 1 in 3 children, on leaving primary education. Generally speaking, children today are not as active as children were 20 years ago. Contributing factors are concerns over safety, more parents working and an increased interest in online activities. More and more children stay socially connected with their friends by playing their computer games online. Hand held devices/tablets are putting strain on young bodies from the hours of sitting in one position, contracting muscles down one side of their body! Our bodies are, however, designed to move and quite frankly if we don’t use it we lose it. It’s empowering to move and it’s particularly empowering for children to be able to stand on their hands as well as their own two feet – they feel free, strong, the sense of achievement is huge and it’s not all about strength! It’s about your body being properly stacked – knees above ankles, hips above knees, shoulders above hips and the cherry on top is your head perfectly balanced on top (this of course is reversed for handstand). Children and young adolescents can and do develop muscular imbalance. Remember that none of us are totally symmetrical but developing body awareness at any age can help avoid imbalances which put strain on our joints and spine and of course cause pain. Most parents will have seen their child kneeling with one foot tucked under; carrying their bag on one shoulder and rotating their upper body while doing so; standing with weight on one leg? This is magnified when the child moves onto secondary education and spends longer at a desk, in front of a laptop! All of these habitual problems can be changed once we become aware. Long term effects could result in shortening of one side of the body, rotation of the pelvis and even scoliosis of the spine. Remember one of the jobs of the skeleton is to protect the internal organs – mis-alignment can ultimately affect our organs too! At the age of 8 children have the awareness and ability to feel and understand their bodies at a much deeper level. Yoga can now be taught with more focus on alignment and connecting their bodies to their mind and emotions. When taught using age appropriate techniques the results are incredible! This all sounds too good to be true! Yoga, however, has been proven to help cognitive, emotional and behavioural outcomes. It provides children and teachers with a self-regulation toolbox to help manage or alter their impulses or responses. Children and teenagers who are already very active can also benefit from yoga. A recent increase in the number of young people participating in competitive sports has resulted in an increase in stress injuries. These stress injuries can be difficult to diagnose and difficult to treat. Some of the more common injuries include Osgood-Schlatter disease, Shin Splints, Stress Fractures and Tennis Elbow! These injuries occur when too much stress is placed in an area of the body resulting in inflammation, muscles strain, tissue damage and sometimes fracture. This is often contributed to an over developed muscle pulling a joint out of alignment. Osgood-Schlatter disease is an inflammatory injury of the growth plate on the tibia, top of the shin bone just below the knee. This point, the tibial tubercle, is the bone attachment for the quadriceps (front of thigh muscles). Those who participate frequently in sports, which rely on powerful contractions of the quads, have a higher incidence of Osgood-Schlatter’s. Such sports include football, netball, hockey, gymnastics & ballet. Although highly active children are at greater risk of developing this inflammatory condition it can also develop in children who go through a very rapid growth spurt. A generalised simplification of this condition is that the quad muscles become tight and the tendon at the attachment point of the bone becomes highly inflamed, causing much pain. This muscle tightness is caused by either overused muscles shortening or the muscles not growing at the same rate as the skeleton! The onset of this condition is always associated with a growth spurt in adolesence. Most common in the ages 10 – 16, but could be later depending on development. Similar conditions are Sever’s disease and Sinding-Larsen-Johannsen disease. Traditional treatment is to rest and stop the offending activity however the average time for resolution is around 21 months when the growth plates close. Giving up a sport/activity for this length of time, limits the child both physically and socially. There are a number of proven physio techniques which use stretching to lengthen these shortened muscles, bringing balance to the knee and allowing the inflammation to subside. These programs can reduce the recovery time from 21 months to just 1 month. Of course, a good stretching program can alleviate this and prevent these injuries from occurring, but children and teens find stretching boring. 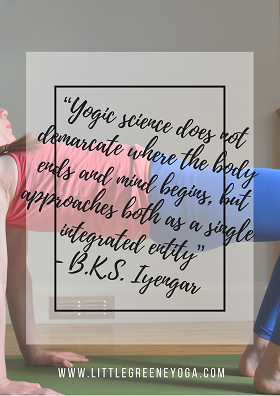 An alignment based yoga program, which is fun and uses proper biomechanics, can rectify the imbalance and perhaps prevent it occurring in the first place. Encouraging the children to participate in yoga will not only balance these overused muscles but teach them how to recognise tight areas in their body. Although children do develop these overuse injuries the majority are more likely to break a bone than develop ligament or tendon injuries. These are usually ‘mis-adventure’ injuries caused by falling off a scooter, bike or out of a tree. The resulting injury is more often to the arm, elbow or collarbone due to the nature of the child extending their arm to save their fall. The injured child can then be in a cast for 4-8 weeks. All LGY 8-12yr teachers are provided with training on how to safely include a child with a cast within their 8-12yr alignment based yoga class. Each teacher is examined on the techniques they would use ensuring a duty of care for the child in the cast and the rest of their class. This training is also provided is our LGY TEEN Teacher training courses where we also educate on how to help young adults modify their yoga practice to encourage quick healing of the overuse injuries, mentioned above. Many teachers would exclude the injured child from the class but with the correct training you can safely continue to teach yoga to the child. They will be excluded from all mainstream activities at school so excluding them from their extra-curricular activities could be detrimental to their developing body and mind. Muscles begin to atrophy within in the first 2 weeks of inactivity, so 6-8 weeks without exercising would see quite a loss in muscle mass. Once the cast is removed the child will struggle to regain their full range of movement. With an alignment based yoga program the child could quickly and safely regain muscle and movement without causing extra strain on other joints and return to full activity in a shorter time.